Ashley Cain and Timothy LeDuc will make their debut at the International Skating Union’s (ISU) World Figure Skating Championships this week in Saitama, Japan. As the lone pair team representing the United States at this season’s most prestigious event, the 2019 U.S. Champions know the pressure weighing on their shoulders to regain that second World pairs spot for Team USA. During a pre-Worlds media conference call organized by U.S. Figure Skating on March 12, Cain and LeDuc admitted that they do feel the pressure, but they like to look at it as an opportunity. To regain that second spot for next year’s World Championships, Cain and LeDuc must achieve a top ten finish in Saitama, which Cain noted will require two perfect performances. Cain and LeDuc have already established themselves among the top pairs teams this season, with their first Grand Prix medal (bronze at Skate America last October) and a solid fourth-place finish at the ISU Four Continents Championships, which occurred less than two weeks after the U.S. Championships. Upon the conclusion of Four Continents, Cain and LeDuc stated that they took a week off from extensive training to recover. “Since Four Continents, we took a little bit of a rest that week and I think it [the time off] was super beneficial because our bodies were super fatigued,” Cain noted, who had experienced some tiredness and dehydration during a practice before the free skate at Four Continents. Cain did not believe the symptoms were the exact result of her concussion at the Golden Spin competition in December, but were more from the quick recovery period that she said she undertook to prepare for the U.S. Championships. “Having to come back so quickly from the concussion and how much went on during the recovery, was mentally fatiguing as well. So we took a break and started building back up again,” Cain added. During that momentary break, Cain and LeDuc’s coaches, Peter and Darlene Cain established a training plan for the team with Russian pairs coach Nina Mozer. Mozer, who coaches 2018 World silver medalists Evgenia Tarasova and Vladimir Morozov as well as Natalia Zabiiako and Alexander Enbert, has been a part of Cain and LeDuc’s coaching team since the 2017-18 season. She has visited the team’s rink in Euless, Texas, and Cain and LeDuc have spent time with Mozer’s team in Russia and Italy. 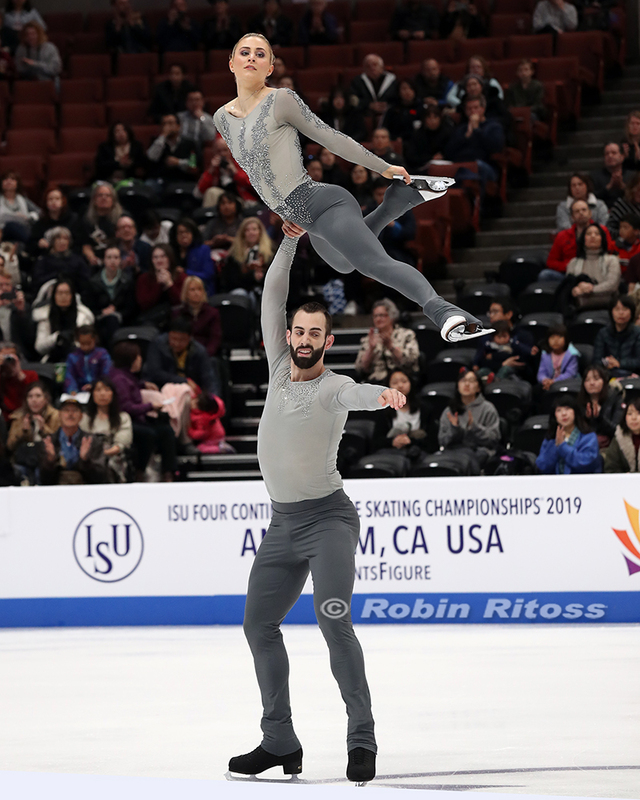 Following the World Championships, Cain and LeDuc will remain in Japan and train with Mozer before competing at the ISU World Team Trophy, April 11-14 in Fukuoka, Japan. They will also do a pairs camp in Russia for about a week and a half in May. “Those are things that she [Mozer] has brought to the table for us, because without her being in our corner or on our team, we wouldn’t be able to experience these camps and learn more,” Cain added. Yet, right now, Cain and LeDuc are preparing to experience their first World Championships, something that they are both enthusiastic about. “There is a lot of pressure and things that have to happen. We are the only [U.S.] team and there are responsibilities, but this is our first World Championships. We have never trained this far into the season so it has definitely been an experience,” Cain mentioned. “And we are just super excited,” LeDuc added with emphasis.